In a pot, combine rice and water. Bring to a boil and reduce to a simmer. Cover and cook for about 30 minutes or until water is absorbed. Remove from heat and let sit for 5 minutes. Transfer rice to a large bowl and stir in vinegar. Let rice cool and add vegetables and nori. 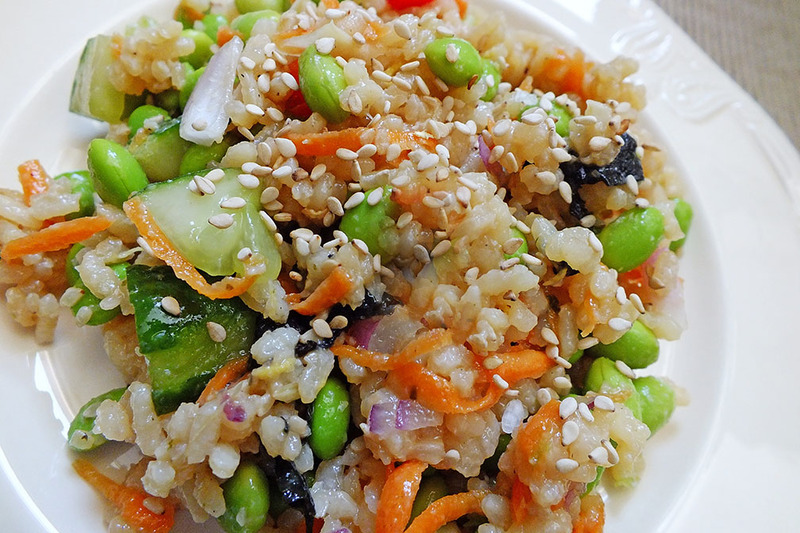 Whisk together the soy sauce and wasabi in a small bowl and add to vegetable rice mixture. Taste and add more soy sauce if needed. Sprinkle with sesame seeds. Serve with pickled ginger. Serves 4. *Sprouting rice (or any grain) increases its nutritional value by making its nutrients more bio-available and reduces the phytic acid, a chemical present on grains that prevents them from germinating until conditions are right, but which blocks mineral absorption in humans. Sprouted brown rice takes half the time to cook as regular brown rice and is more digestible and nutritious from the soaking and drying process. You can use regular brown rice for this recipe if you don’t have presprouted rice, or for best nutrition, soak the rice overnight before cooking.